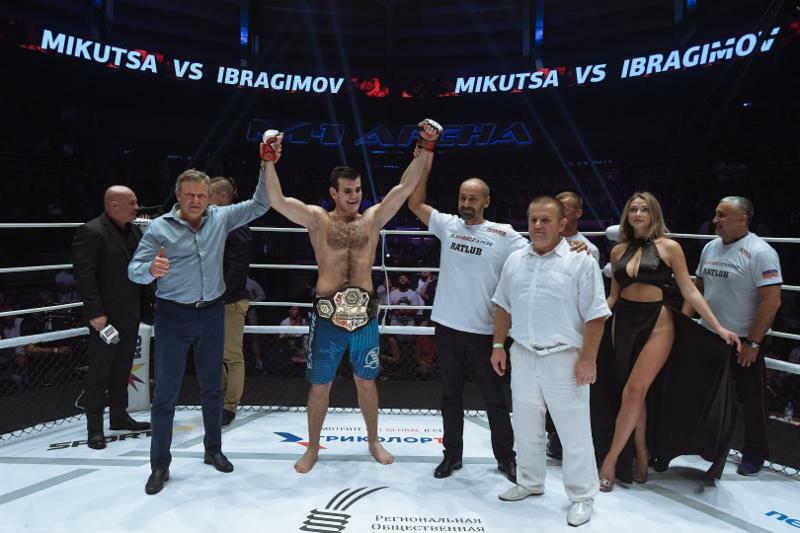 Undefeated Khadis Ibragimov (7-0-0) defeated Dmitry Mikutsa in last night’s M-1 Challenge 96 main event to capture the vacant M-1 Challenge light heavyweight title, at M-1 Arena in Saint Petersburg, Russia. MMA fighters represented 10 different countries in this international event: Russia, United States, Ukraine, Brazil, France, Poland, Hungary, Czech Republic, Kazakhstan and Georgia. Ibragimov, fighting out of Russia, locked in a rear-naked choke to submit his Ukrainian opponent, Mikutsa (9-4-1), in the second round for the vacant M-1 Challenge light heavyweight crown. In the co-featured event, Russian featherweight Viktor Kolesnik (15-3-1) finished off his American foe, Daniel “Agent Orange” Swain (18-9-1) in the opening round with damaging leg kicks. Brazilian lightweight Michel “Sassariro” Silva (20-7-1) was too much for previously unbeaten Alexey “Phenomenal” Ilyenko (8-1-1), who succumbed to a vicious ground-and-pound attack. Ukrainian featherweight Yuri Chobuka (10-1-0) took a unanimous decision from Steve Polifonte (13-6-0), of France. Georgian flyweight Vazha Tsiptauri (6-1-0) handed Sanzhar Adilov (4-1-0), of Kazakhstan, his first loss as a professional by way of a unanimous decision. On the undercard, Russian heavyweight Yuri Fedorov (2-0-0) ground-and-pounded his way to a third-round technical knockout of fellow countryman Sergey Goltsov (0-2-), Russian featherweight Akhmadkhan Bokov (4-3-0) edged pro-debuting Adam Borovec (0-1-0) via majority decision, and Russian featherweight Nikita Solonin (5-2-0) registered a unanimous decision victory against Rene Hackl (4-1-0), of Hungary). Russian pro-debuting Vasily Kozlov (1-0-0), fighting at a 158 ½ catchweight, and Russian welterweight Boris Medvedev (3-0-0) were first-round, one-punch knockout winners, respectively, versus Jurand Lisieski (3-1-1), of Poland, and Ukrainian Dmitriy Tikhonyuk (0-1-0). Russian lightweight Artem Tarasov (3-1-0) used a barrage of punches to stop Filip Kovarik (3-1-0), of Poland, in round one.